Law & Oarder, Phillips Murrah’s rowing team, stands with the medals they won after competing in the 2017 Oklahoma Regatta Festival. 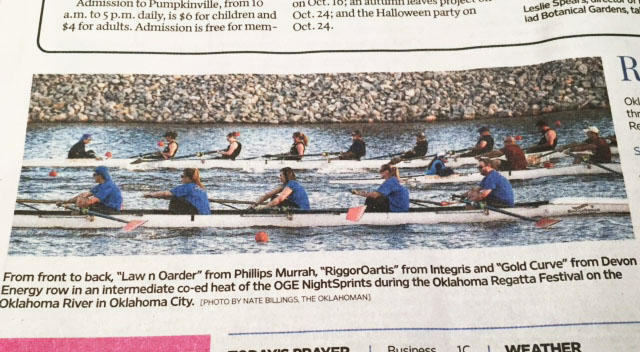 Phillips Murrah’s rowing team Law & Oarder completed the Fall 2017 season by placing third in the annual regatta competition. 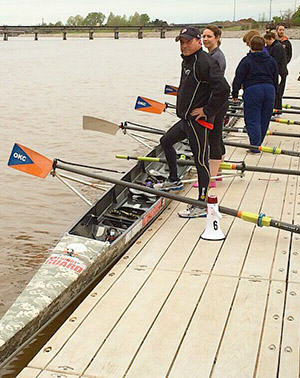 The team competed on Oct. 6 at the 2017 Oklahoma Regatta Festival held at the OKC Boathouse District in the advanced league and achieved a 500-meter run of 2:16.688. 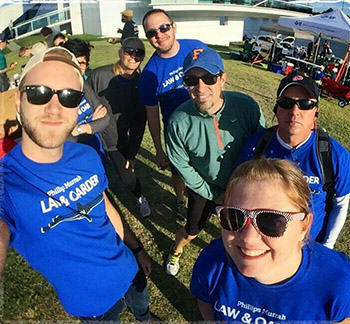 In all seven seasons the Firm’s rowing team has competed, team members consisted of both attorneys and staff members. The team will resume practice in the Spring for the Stars & Stripes Festival in June 2018. Phillips Murrah has been recognized as one of the Best Places to Work in Oklahoma in 2017 and an Oklahoma Top Work Place by The Oklahoman/WorkplaceDynamics two years in a row. Our Firm strives to recognize and reward our employees for excellence. Twenty Phillips Murrah Attorneys have been selected for inclusion in the 2017 edition of Thomson Reuters’ Super Lawyers for their excellence in their respective practice areas. Seven attorneys of them under the age of 40 were recognized as Rising Stars. Super Lawyers is a research-driven, peer influenced rating service of outstanding lawyers who have attained a high degree of peer recognition and professional achievement. The Super Lawyers lists are published in Super Lawyers Magazines and in leading city and regional magazines across the country. Using the same patented process for selecting Super Lawyers, Rising Stars recognizes up and coming lawyers who are 40 years old or younger and have been in practice for 10 years or less. Directors G. Calvin Sharpe and Lyndon W. Whitmire were among the Top 50 Oklahoma Super Lawyers for 2017. Directors Shannon K. Emmons and Sally A. Hasenfratz were listed on the Top 25 Women Oklahoma Super Lawyers for 2017. Molly Tipton, G. Calvin Sharpe, Melissa Gardner, Jennifer Miller, Tyler Sullivan, Monica Ball, Deann Aderholt, Sam Lincoln, and Deena Baker stand with their bronze medals after racing at the Stars and Stripes River Festival on June 24. 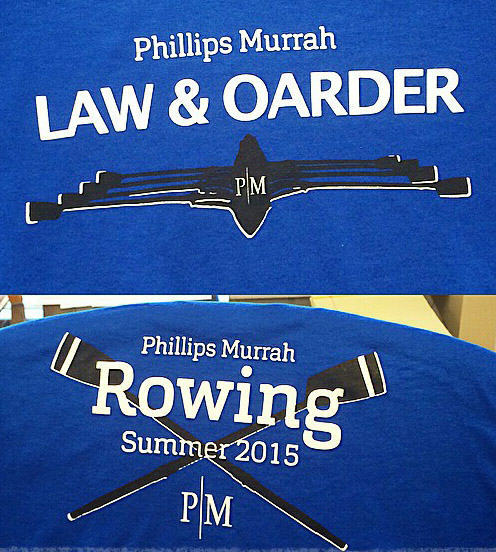 Phillips Murrah’s rowing team Law & Oarder completed the Summer 2017 season by placing third in the annual regatta competition. 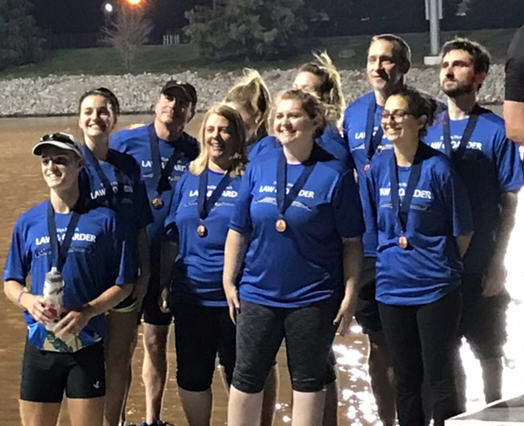 The team competed on June 24 at the Stars and Stripes River Festival held at the OKC Boathouse District in the advanced league and achieved a 500-meter run of 2:02. “I decided to join the rowing team because I wanted to try something that was completely new to me” Attorney Molly E. Tipton said. “Not only was it something I had never done, but I also had the opportunity spend time with people at Phillips Murrah that I don’t often see, which ended up being my favorite part! The team will continue their practices through the summer and into the fall, leading into the final regatta, which will be held in October. 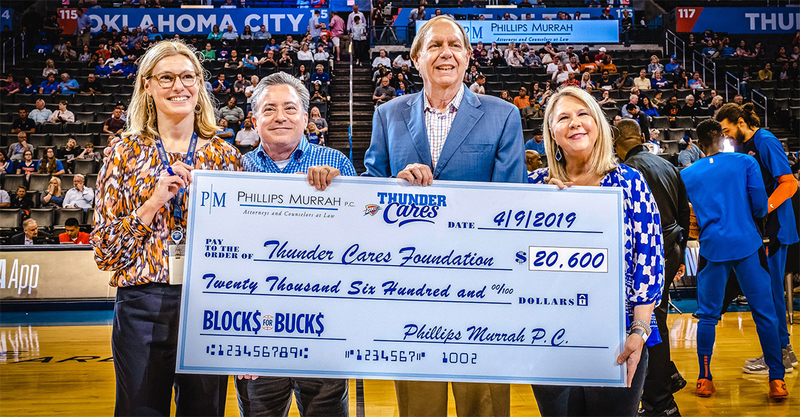 “I absolutely love the opportunity Phillips Murrah has given us to get out there and work as a team outside of the office,” Legal Assistant Deena Baker said. “Even though we’ve been up against some pretty elite teams these last three seasons, it just gives us more to strive for in the end. Phillips Murrah has been recognized as an Oklahoma Top Work Place by The Oklahoman/WorkplaceDynamics two years in a row. Our Firm strives to recognize and reward our employees for excellence. By Director G. Calvin Sharpe. This guest column was originally published in The Journal Record on November 29, 2016. G. Calvin Sharpe has 30 years of experience in Oklahoma courtrooms, representing a diverse list of business clients in matters relating to medical malpractice, medical devices, products liability, insurance and commercial litigation. The Reptile Theory is a legal trend that has recently gained popularity with the plaintiff’s bar. It is a strategy used to shift jury attention from considering complex trial details typical of a medical malpractice case, to reaction-driven responses that arise from the reptilian portion of the brain. The most primitive cognitive functions, such as breathing, hunger and survival, are generated from this inner portion of the brain, called the basal ganglia or the reptilian complex. With the common assumption that jurors want to expose and punish the existence of danger, Reptile attorneys seek to establish the defendant doctor or health care provider as careless, indifferent or even malicious in their disregard for safety. The jury’s perception that the defendant endangered the plaintiff will stimulate the survival mechanism deep in their reptile complex. Thus, the jury will act to protect themselves and the community by awarding a substantial verdict in favor of the plaintiff. As a health care defense litigator in Oklahoma, I have experienced this method firsthand. The Reptile Theory is successfully utilized to secure favorable verdicts and high damage awards. However, just as trends ascend, so do counterstrategies. The Reptile strategy is not the Jedi Mind Trick, and with proper preparation, defense lawyers can derail Reptile attorneys’ efforts before they can derail the jury. A critical part of defending the Reptile method is to spend adequate time preparing witnesses for deposition, and subsequently, trial cross-examination. During deposition, the Reptile attorney will likely begin the process of establishing a collection of artificial safety rules that exceed the degree of prudence and caution required by law, known as Standard of Care. For example, a deposed physician may be asked, “Is the ultimate safety of a patient the most important consideration in medical care?” An unprepared defendant would naturally want to say, “yes, of course.” However, this can be used during trial to characterize the physician as careless and unsafe when artificial safety rules established in deposition are contradicted, even if they exceed the legal standard of care required for a physician or health care provider. Understanding of Reptile Theory within the legal community is still evolving. Defense lawyers are well-advised to educate themselves, their clients and the judge prior to squaring off against a Reptile lawyer. G. Calvin Sharpe is a trial lawyer at Phillips Murrah law firm in Oklahoma City. G. Calvin Sharpe has 30 of years of experience in Oklahoma courtrooms, representing a diverse list of business clients in matters relating to medical malpractice, medical devices, products liability, insurance and commercial litigation. Q: Generally speaking, what was the Dollar General case about, originally? Q: The Supreme Court decision was tied, 4-to-4, which means that the lower court decision of the U.S. Court of Appeals for the Fifth Circuit is upheld. What was that Fifth Circuit’s upheld decision? A: At the heart of this decision is the question of whether tribal courts have the right to exercise civil authority over people who are operating within tribe’s jurisdiction, but who aren’t tribal members. In the federal case subsequent to the tribal rulings in Choctaw courts, Dollar General petitioned for certiorari, which means they asked a higher court to review the determination of a lower court. In the judgment of the U.S. Court of Appeals for the Fifth Circuit, Indian tribal courts have jurisdiction to adjudicate civil tort claims against nonmembers, including as a means of regulating the conduct of nonmembers who enter into consensual relationships with a tribe or its members. Q: How has this Supreme Court ruling, essentially allowing the lower court decision to stay, changed the nature of tribal jurisdictional authority? A: In the decision of the appeal to the Supreme Court of the United States of America, the high court was deadlocked, which allows the decision of the U.S. Court of the Appeals for the Fifth Circuit to stand. The judgment is affirmed by an equally divided court, (which) allows the case to proceed to resolution in tribal court without further appeals regarding authority. However, there’s the likelihood that, in a similar case, the Supreme Court would grant another certiorari when the Senate confirms a replacement for Justice Scalia. Q: Why is this viewed as a success for tribal sovereignty and tribal governmental authority? A: Thursday’s Supreme Court ruling served as a significant win in the fight for native tribal court authority. The Supreme Court tie affirms native groups’ right to self-determination. This allows federally recognized tribes to continue developing their own governmental bodies.